During the Netherlands Film Festival, EFSP presents the Unofficial Dutch Film Star Postcards Festival. 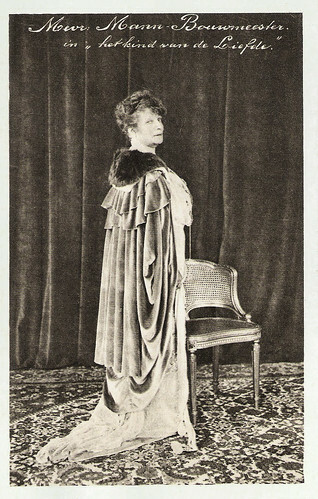 Today's spotlight is on Dutch stage and film actress Theo Mann-Bouwmeester (1850-1939), born in a famous Dutch stage family and sister of Louis Bouwmeester. Inspired by Sarah Bernhardt, she had her breakthrough in 1880. From then on she was known for her wide repertoire, from classical tragedies to contemporary pieces. 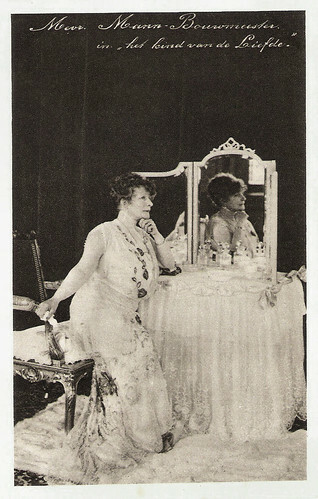 ’The Grand Dame of the Dutch stage’ also appeared in several Dutch silent films often directed by her son Theo Frenkel Sr. In 1926 she said farewell to the stage after playing her most famous role, Liane Orland in Henry Bataille's The Child of Love, in 67 cities. Dutch postcard by Koninkl. Nederl. Boek- en Kunsthandel M.M. Couvée, Den Haag (The Hague). Photo: publicity still for the stage production of Het kind van de liefde (L'Enfant de l'amour/The Child of Love) by Henry Bataille. Theodora Antonia Louisa Cornelia Bouwmeester was born in Zutphen, The Netherlands, in 1850. She was the daughter of the actors Louis Frederik Johannes Rosenveldt and Louisa Francina Maria Bouwmeester, who happened to be on tour when their daughter was born. ‘Doortje’ was born into the most important Dutch actors family and the legendary Louis Bouwmeester was her elder brother. Doortje made her debut as a six-year-old in the stage company of her father. She continued to play small stage parts and at 17 she married musician Maurice Frenkel, with whom she would have four sons. At 23 however, she was a widow and she decided to continue earning the money for her family as an actress. Initially, her stage career was not remarkable while she performed in melodramas and farces. In 1880, she saw a stage performance by Sarah Bernhardt in Amsterdam and ‘la divine Sarah’ became her great source of inspiration. That same year, Theo Bouwmeester experienced her breakthrough to the main public with the title role in the French comedy Froufrou by Henri Meilhac and Ludovic Halévy and in the following years she became the grand Dame of the Dutch theatre. She was the Dutch performer in excellence of passionate, loving and suffering women – especially in great roles as Marguerite Gauthier, Maria Stuart and La Tosca. She had a wide repertoire, from classical tragedies to contemporary pieces. From 1885 on, she was connected to the prestigious Koninklijke Vereeniging Het Nederlandsch Toneel (The Royal Dutch Theatre). In 1920, she participated in an actors strike and this would trigger the end of her career. In 1926, she said farewell in one of her popular roles, Liane Orland in Henry Bataille's Het kind van de liefde (The Child of Love). Dutch postcard by Koninkl. Nederl. Boek- en Kunsthandel M.M. Couvée, Den Haag (The Hague). 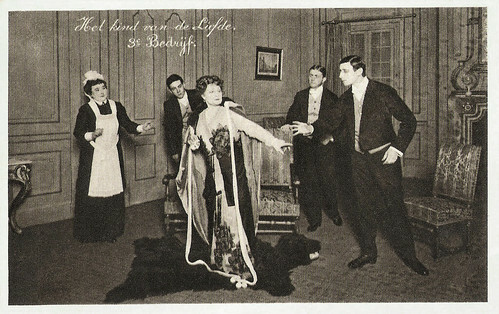 Photo: publicity still for the stage production of Het kind van de liefde (The Child of Love). It was a scene from the third act. Theo Mann-Bouwmeester played in five silent films of which four were directed by her son, Theo Frenkel Sr. In her first film, Koning Oedipous/King Oedipus (1912), she played Queen Jocasta opposite her bother Louis Bouwmeester in the title role. Six years later, her son directed her and her brother Louis Bouwmeester in Pro domo (Theo Frenkel, 1918) also with their niece Lily Bouwmeester. She had a supporting part in Helleveeg/The She-Devil (Theo Frenkel, 1920) featuring Mien Duymaer van Twist. When her son started his own film company in Germany, she appeared in his Judith (Theo Frenkel, 1923) with Helena Makowkska. Her last film was Frauenmoral/Women's Morals (Theo Frenkel, 1923), again starring Helena Makowkska and Oscar Marion. Theo Mann-Bouwmeester was married three times and thus performed under different names. Chronologically, she performed as Doortje Bouwmeester, Doortje Frenkel-Bouwmeester, Théo Brondgeest-Bouwmeester and Théo Bouwmeester) but she is best known under the name she used during her last marriage with the musician and composer Gottfried Mann. Since 1950, the Theo d'Or prize has been awarded to the best female lead in the Dutch stage season every year. Another award named after her is the Theo Mann-Bouwmeester ring. This ring designed by Jan Eisenloeffe was donated to her by admirers in 1911. In 1934, Mann-Bouwmeester donated the ring to Else Mauhs, who was the most outstanding Dutch actress in her eyes. After that, the Theo Mann-Bouwmeesterring was worn by the Dutch actresses Caro van Eyck, Annet Nieuwenhuijzen, Anne Wil Blankers, Ariane Schluter and since 2017 by Halina Reijn. Theo Mann Bouwmeester had four sons from her first marriage to Maurits Frenkel, including actor and film director Theo Frenkel sr. Actor Theo Frenkel Jr. was her grandson. There were many tragedies in her life, including the early deaths of her eldest and youngest sons. Her third son, Louis, died in 1900 at the age of 31. Sources: HHJ de Leeuwe (Huygens.ing – Dutch), Piet Hein Honig (Acteurs – en Kleinkunstenaars-Lexicon – Dutch), Een levenlang theater (Dutch), Wikipedia (Dutch) and IMDb.